South Florida Commuter Services a Program of The Florida Department of Transportation is working with the Downtown Development Authority and are conducting an opinion survey for people in the vicinity of the Complete Streets project on SE/SW 1st street between SW 2nd Avenue and Biscayne Blvd. 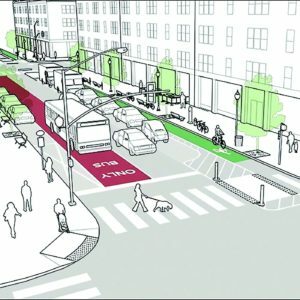 The three-lane street has been re-purposed and it features a car lane, a red bus-only lane and a dedicated green bike lane. This initiative is a collaborative approach between the Miami DDA, Miami-Dade County – Department of Transportation and Public Works (DPTW) and City of Miami. Your feedback on this project is valuable to us.